The wheels of publishing never stop. I returned from the World Fantasy Convention in Baltimore last night with a heavy bag of new fantasy releases, weary and content. And before I even had a chance to open the bag and start telling you about any of those books, today’s mail brings more — including Mirah Bolender’s debut novel City of Broken Magic, featuring a bomb squad that defuses magic weapons. Here’s the description. Five hundred years ago, magi created a weapon they couldn’t control. An infestation that ate magic ― and anything else it came into contact with. Enemies and allies were equally filling. Laura, a new team member, has stayed alive longer than most. Now, she’s the last ― and only ― sweeper standing between the city and a massive infestation. City of Broken Magic earned a starred review from Publishers Weekly, no small feat. Here’s a snippet. Monsters are threatening to take over the city of Amicae. The government has convinced residents that the monsters can’t get in, but Clae and Laura know that isn’t true. They are Sweepers, the only people in the city qualified to fight the monsters and make sure they can’t return — and narrator Laura has only been an apprentice for three months. The duo takes on mobsters, corrupt businessmen, and a deliberately skewed cultural narrative, culminating in a fight to protect their city from its own refusal to accept reality. Amicae’s strict caste system is expertly woven into the fast-paced plot that will keep readers turning pages until the very end. This debut builds a fascinating setting that readers will want to keep coming back to. 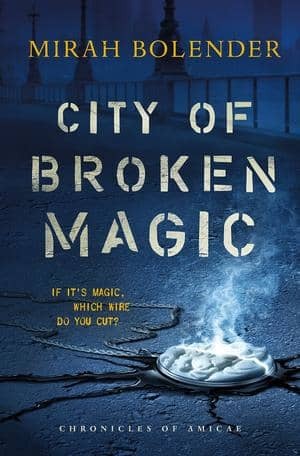 City of Broken Magic will be published by Tor Books on November 20, 2018. It is 400 pages, priced at $15.99 in trade paperback and $9.99 in digital format. The cover is by Tony Mauro. Read more at the author’s website.